Use AppFollow Telegram Bot to get updated about app changes, find new ASO trends and keywords right in your Telegram or a group chat. 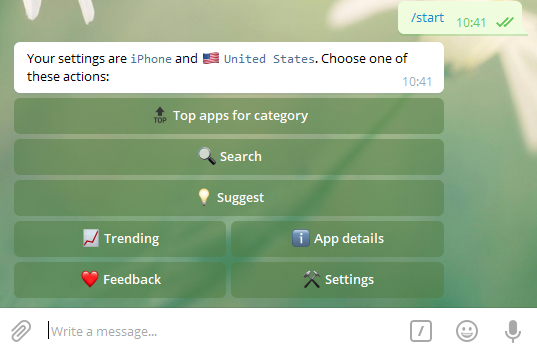 Make sure you have added a Telegram integration. 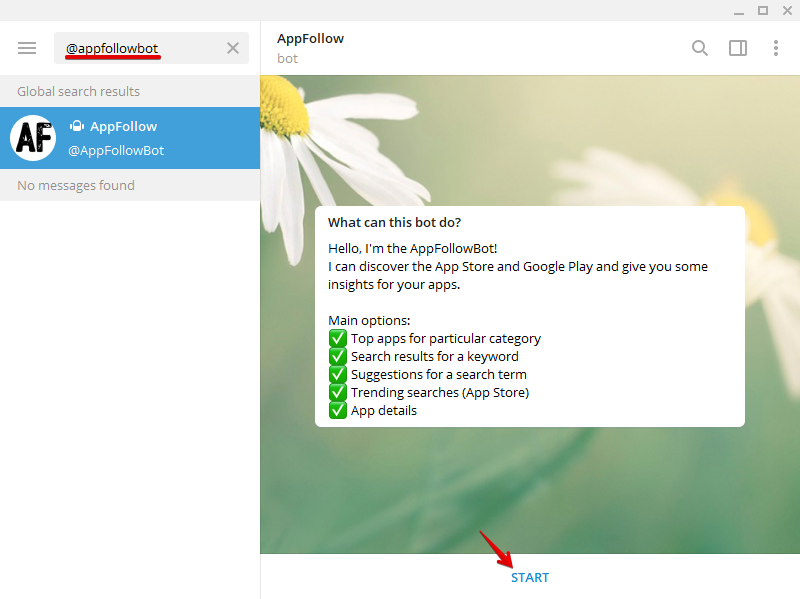 Add Telegram bot @appfollowbot and click "Start" (or type /start and click enter) to get the access to the main menu. Next time use /help command to get back to this menu. So far the bot supports only App Store and Google Play. 3. You will see the list of 100 apps. By clicking each of the app, you will be redirected to its app store page. 3. Get the list of 100 apps that rank for this keyword. By clicking each of the app, you will be redirected to its app store page. 3. Get the list of 10 keywords suggestions related to the topic. Trending Search shows what requests are becoming popular in different countries. This option helps you quickly react and add related keywords to your app before this requests become overly competitive. The feature shows the basic app data from the app store. Here you can check any app. 4. You will see the app data: a developer, a category, price, the app size, versions, app description, the latest update, and the link to the app store. The bot doesn't show the historic data, so you can check only daily results. Leave us feedback by clicking ❤️ in the main menu. Set up Telegram Reply Bot to reply to app reviews not leaving your Telegram app. Need help? Just hit the chat button on the right, we're all ears!